This past month was hectic. It was the end of a fiscal year, my 2010 business plan needed to be completed and my father turned 80. My garden required more attention than I gave and the weeds intruded. I plucked a couple each time I walked by, but one very curious growth piqued my interest and so I let it be. Weeks back I noticed the pair of cotyledons in a most inhospitable location in my garden. They sprouted in a gravel portion of walkway impervious to most vegetation. The plant’s appearance was akin to something edible, but it was not the child of any vegetable I planted. I didn’t pluck it, nor did I foster its growth and through the hottest days we’ve had thus far -it endured, with almost no water. When the next leaves appeared, I finally knew what it was and from where it came. Last year I had kept seeds scooped from a store bought pumpkin for a Thanksgiving pie, but I had never done anything with them. In late spring I put them out for the squirrels and the birds, but evidently there were some escapees and voila, my unexpected guest materialized. *No insects were hurt during the making of this post. Earlier this month Agriculture Secretary Tom Vilsack proclaimed August 23-29 National Community Gardening Week to encourage Americans “to connect with the land, the food it grows and their local communities”. I once read that Baltimore has nearly 100 community gardens. Below is a collection of images from just a hand full of gardens in the city, but you can still get an idea of the different types of foods being grown here. When these pictures were taken, it was over the course of some of the hottest days in Baltimore this year. While the gardens were holding up surprisingly well, hardly a gardener could be found. Nasturtiums, purple greens and tomatoes among others. This lone pepper plant seems especially well cared for. Here there were some devoted gardeners braving the heat and humidity. Swiss chard and a late, but apparently fruitful tomato. An immaculate plot with abundant rosemary and squash. Some very healthy looking okra with attractive blooms. Tomatillos using a nearby leek as a trellis. 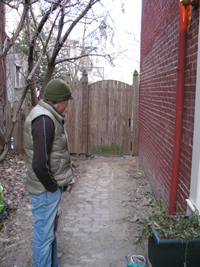 The Fells Point garden is gated and unfortunately there is little visibility from the outside. This is my only shot. Patterson Park has the largest community garden in Baltimore city. Several years ago I had a plot in Patterson Park and what I liked most about the garden was the variety of people there. Gardeners of young and old, from different cultural and ethnic backgrounds with mixed faiths communed and great stories were told over weeding, plowing and picking. Tinges Commons is one of the latest and most unique additions to Baltimore’s community garden roll. This small garden had the best looking selection of eggplant. As a dual-purpose community and public art space, here garden parties are combined with art openings. Remington gardeners make great use of their medium sized garden with mass plantings. Here you can find a plethora of strawberries, asparagus, and taro among other vegetables. Gardeners also conserve water by keeping the garden hydrated with rainwater runoff from a nearby building. The gardens at City Hall are one of the few locations that corn can be found growing in the city. The Baltimore City Hall vegetable gardens, conceived of before the Obama’s started their garden at the White House, serves to educate the public and feed the homeless. 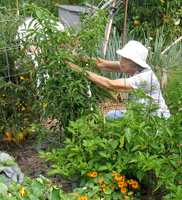 If you are interested in joining a community garden in Baltimore city, check out the Community Greening Resource Network and contact Baltimore Parks and People Foundation for more information. Happy National Community Gardening Week everyone! Window box with tomato plant, herbs, edible & ornamental flowers. During World War II the US government encouraged citizens to plant family vegetable gardens, dubbed “Victory Gardens“, to increase self-reliance, reduce pressure on the American food supply and help support the war effort. Millions of Victory Gardens were planted in all shapes and sizes and filled even the most unusual spaces. From backyards to office buildings, small and large-scale gardens sprouted up all over the place. In the advent of global warming, two ongoing wars, and the quest for energy independence, it is the perfect time to resurrect the Victory Garden. Michelle Obama is recreating the White House lawn with a variety of useful plants and Baltimore’s Mayor Dixon is filling the formal gardens at city hall with vegetables. Anyone can have a Victory Garden; all you need is dirt, sun and plants or seeds. If you do not have a yard, a container garden is a great way to start. Just about any container can be used to grow plants, and while I’m not advocating “questionable” taste that may bother your neighbors, resourcefulness and creativity can add great interest to your garden. 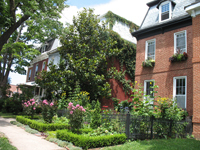 Take a look around Hampden and other yarded old neighborhoods for great ideas! I have four window boxes, all made of scrap wood as well as a variety of other containers, some purchased, some found, in varying materials and sizes. The only requirement of containers for plants is that they must have drainage holes. If you are using found objects for your containers, just make sure to cut or drill a hole in the bottom to allow water to drain out easily. If your plants end up sitting in water for extended periods of time, they will die. 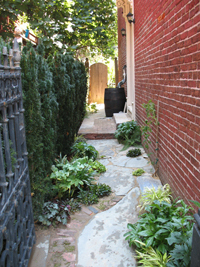 A Baltimore container garden is likely to require a lot of water, but it also still needs to drain properly. After you have selected or made your container, adding dirt is the obvious next step. Plants are generally resilient, but if you are planning to grow vegetables, you may want to consider purchasing some quality dirt. If you are planning to use found dirt, consider having the soil tested. Many cities are known to have soil with high levels of lead. A soil test will cost you less than twenty dollars and could save your health. For a link to places to buy plants and dirt in downtown Baltimore and for more information on soil testing, CLICK HERE to link to my other blog entry: Urban Gardening First Things First. When adding dirt to your container, leave about an inch of room at the top, so that a pool can form briefly while watering. This ensures thorough and even saturation. If you are using a watertight container, such as plastic or metal, it is wise to put a layer of rocks at the bottom to aide in draining. Any rocks, broken brick, concrete, etc will do. Just be aware that some stones can alter your PH level. How many, and what kind of plants can I put in a container Victory Garden? Plants were here before us and are likely be here long after, so feel free to try just about anything in your container garden. However, if adventure is not what you are looking for, plants from the nightshade family are know to grow well in our area in summertime. This includes tomatoes, peppers, eggplants, potato, flowering tobacco, and petunias. Nightshade plants are also unattractive to rodents. If rats are a concern, these are a good bet. When adding plants, insert them just deep enough for soil to cover a small portion of the stem, just above the roots. For seeds, follow the directions on the seed package. Although you will get varying opinions on how compact your container should be, I am a fan of making them both full of plants and variety. Herbs are great compliments to vegetables visually and help to deter insects. For more information on controlling insects with herbs, CLICK HERE. If your congested container garden begins to get overcrowded or unruly, you can always cut, trim and stake the plants as they grow. Water, water and more water. East coast summers can be sweltering and, unlike you, plants cannot escape the heat. On most days, I water my plants at least once each day and on very hot days, twice a day. 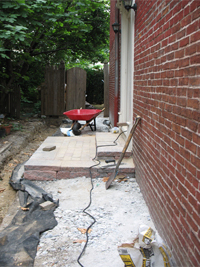 It is very unlikely that you will over water a Baltimore summer container garden. So, unless you start to see limp yellow leaves (an indication of too much water), water away! It should be known, that while I stress the importance of watering, I am not encouraging waste. Most of my water is reused and collected water runoff. You too can be resourceful with the water you use for your garden. 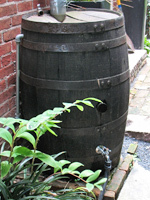 Shower with a watering can, use your dishwater and install a rain barrel, for example. When fertilizing, sometimes less is best. Know what is in a fertilizer before using it. The best thing about growing your own vegetables and herbs is that you are in control of what they come in contact with. If your plants are underperforming, consider the basics first, water and sun. The primary diagnosis of weak plants is lack of water or sun. If you are convinced that sun and water are not the problem, then look for natural fertilizers. A mini kitchen composter may also be a great way to use your food scraps to boost your container garden. They are usually inexpensive and can easily be found online. I would love to see pictures of your Baltimore Victory Gardens. Please send images to joeltheurbangardener@yahoo.com and I will add them to my blog. Also, feel free to contact me with questions about your garden. I am happy to help. Should you find yourself immersed in your vegetable garden and find yourself thirsting for more, check out Baltimore’s Urban Agriculture Blog. 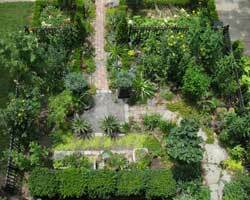 Here you will find additional info for urban agriculture gardening enthusiasts.